Easton Middle School’s Presentation of “Peter Pan” Supports the Mission of Talbot Humane Once Again! 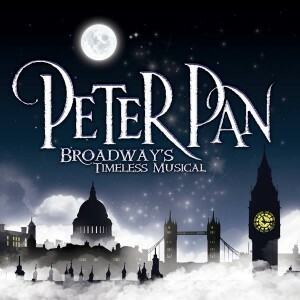 This year Easton Middle School will be presenting the musical Peter Pan under the direction of Richard A. Vitanovec. Vitanovec, who has a BA in Acting, a BA in Directing, and his teaching certificate from Lycoming College and his Master’s Degree in Theatre Production from Central Washington University, has always strived to give the students at Easton Middle School the most professional, top-notch theatre experience possible. He has created a theatre community where not only middle school students can participate, but also elementary and high school students. This production of Peter Pan includes over 40 students as well as Talbot County Public School faculty. Last year, NBC aired a production of PETER PAN LIVE that starred Allison Williams as Pan and Christopher Walkin as Hook. For the first time ever, a real dog was used to play the role of “Nana”, the Darling’s dog-nurse. Typically, this role is played by an actor in a dog costume. Bill Berloni, known for being one of the best dog trainers for Broadway and Hollywood, trained his rescue dog, Bowdie to play the role. Wanting his students to have as much of a professional experience as possible, Vitanovec contacted Mr. Berloni in hopes that he could help him with “Nana” for the Easton Middle School production. Berloni has trained dogs for years for Broadway and Hollywood. He provided one of his canine actors, Mikey, for last year’s EMS production of Annie. Mr. Berloni graciously agreed to bring Bowdie to reprise his role as “Nana Darling” in Easton Middle School’s production at the end of January. Although only the second time a real dog has played Nana in the musical, this will be the first time that a real dog has done it live on stage for an audience. 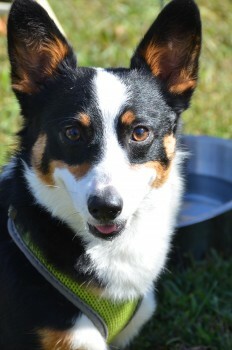 Bill Berloni found Bowdie in 2014 when his family could no longer keep this smart, energetic dog. He began training to be Winn Dixie in a production of BECAUSE OF WINN DIXIE THE MUSICAL at the Delaware Theatre Company in the spring of 2015. Along the way, he was cast as the first dog to ever play “Nana” in PETER PAN LIVE on NBC. After performing in Delaware, Bowdie was cast in a music video and several television shows. Mr. Berloni is a 2011 Tony Honoree for Excellence in Theatre and 2014 Outer Critics Circle award for Special Achievement. Broadway: THE AUDIENCE with Dame Helen Mirren; LIVING ON LOVE; BULLETS OVER BROADWAY, LADY DAY AT THE EMERSON BAR AND GRILL; ANNIE (original and all revivals), A CHRISTMAS STORY THE MUSICAL, LEGALLY BLONDE, CHITTY CHITTY BANG BANG, JOE TURNER’S COME AND GONE, CAMELOT, FRANKENSTEIN, THE FIRST, ALICE IN WONDERLAND, OLIVER!, ANYTHING GOES, NICK AND NORA, THE WIZ, (20th Anniversary revival and City Center 2009) THE WIZARD OF OZ, DINNER AT EIGHT, DOUBLE FEATURE (NYCB), THE WOMAN IN WHITE, AWAKE AND SING and THE LIEUTENANT OF INISHMORE. Mr. Berloni is the Animal Director of the new musical BECAUSE OF WINN DIXIE with music by Duncan Sheik and book and lyrics by Nell Benjamin. He has trained animals for hundreds of Off-Broadway, regional theatre, tours, television and movies. Recent films include Sandy in the new movie of ANNIE starring Quvenzhane Wallis, Jamie Foxx and Cameron Diaz. Other television includes POWER, BILLIONS and MR ROBOT. Mr. Berloni and his family are the subjects of a new docu-series entitled WAGS TO RICHES WITH BILL BERLONI on the Discovery Family Channel that premiered in August 2015. He is the author of BROADWAY TAILS, DOGA and SANDY THE AUTOBIOGRAPHY OF A STAR. He is also Director of Animal Behavior at the Humane Society of New York. It is an amazing opportunity and experience these students will have working with someone so highly accredited in the professional theatrical world. Sharing the stage with an experienced canine theatre star is something these students won’t forget for a long time. Come see stage and screen star Bowdie as “Nana” in Easton Middle School’s production of Peter Pan. Performances are January 22, 23, 29, 30 at 7:00 pm and January 24 at 2:00 pm. “NANA’S PANTRY”- Bring 4+ cans of cat or dog food or a bag of cat or dog food to the show and you will be entered in a raffle for a special prize. The cat and dog food will be donated to Talbot Humane to help all the rescued animals that find their way there. Tickets can be purchased at the door or in advance at Easton Middle School, Crackerjacks, Little Rascals Consignment Shop, Reesers’ Pharmacy, and Rise Up Coffee Roasters on Dover St.
RESOLVE to Save Lives in 2016! 2 LOW or NO Cost Programs to SAVE LIVES! Spaying or neutering your pet can decrease the risk of diseases that are expensive to treat. Pets that are spayed or neutered have up to an 85% lower risk of certain types of cancers and other serious health complications. Animals that are fixed make better companions because they are not motivated to wander in search of a mate. Good for you — eliminate annoying behavioral problems. Altered animals are significantly less likely to mark or spray urine. Female animals in heat can cry incessantly, act nervous and attract males from all around. Having your pet spayed eliminates the heat cycle. Animals that have been spayed or neutered are less likely to bite, roam or get into fights. A compassionate society knows there is a better way to solve overpopulation than needlessly euthanizing unwanted animals. Communities spend millions of dollars to control unwanted companion animals. Spaying and neutering helps reduce the number of strays and unwanted animals in our community. Spaying or neutering reduces an animal’s desire to roam, resulting in fewer traffic accidents and neighborhood complaints of nuisance animals. 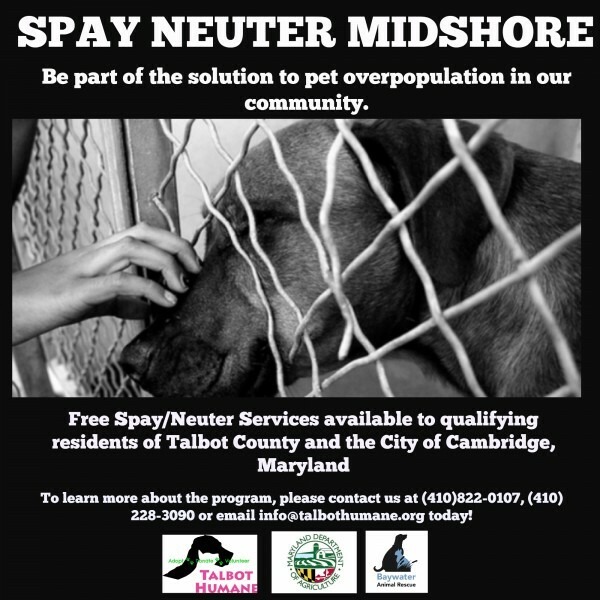 Thanks to a generous grant from the Maryland Department of Agriculture and private funding, we are able to offer qualifying residents FREE spay/neuter services for ALL DOGS AND CATS within Talbot County and the City of Cambridge, Maryland. You must have proof of residency of Talbot County or The City of Cambridge Maryland. Proof of income at or below $43,000 annually. That is it! 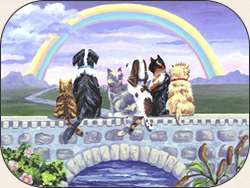 You can Download the Spay/Neuter Midshore Application (dog and cat) now! Are you a Talbot County OR Dorchester County resident? Is your cat between the ages of 8 weeks and 3 years old? Does your cat go outside or does he or she live outside all the time? If you answered “Yes” to all of these questions you are eligible for this very special program regardless of income. 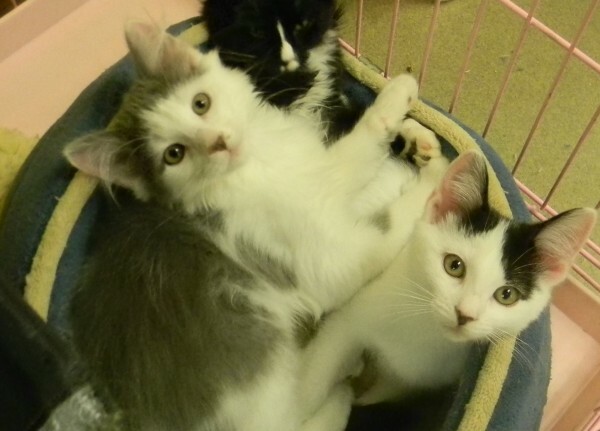 Project Feline Fix is targeted to prevent litters of kittens from arriving in Talbot County. Thanks to a generous grant from The Snyder Foundation for Animals all cats 3 years old or younger, that are indoor/outdoor or outdoor only pets and owned by Talbot County or Dorchester County residents will be spayed or neutered for only $10- this includes the rabies and distemper vaccinations! Lets prevent more litters of unwanted pets from entering our shelters and get your Feline Fixed. To sign up for this program call Talbot Humane TODAY (410)822-0107. Bark in the Park 2015- Success Because of YOU! On October 10th, for the 6th year in a row we had beautiful weather and a full Idlewild Park in Easton to celebrate our love for our pets! 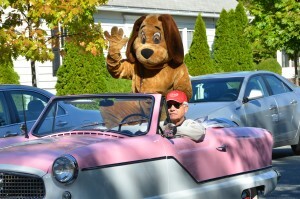 More than 1,000 visitors joined us in the 5K fun run, Dog Walk Homecoming Parade, Fun Dog Show and so much more. The day was full of fun, fellowship and fundraising for the animals of Talbot Humane! Raising more than $47,000 for the animals, YOU made the day a success for animals in need. The day would not happen without the support of our community partners, volunteers and visitors. Thank you all! Imagine if you could truly make a difference in the life of an animal by giving up one cup of that delish special coffee you love each week. Or one bottle of pop. How about 1 or 2 hours of your personal time given to help an animal each week or month? Truth is, that small sacrifice WILL make a difference in the life of an animal at Talbot Humane. It is easy for us to think we cannot affect change because we cannot make a large monetary gift, or, share hundreds of hours of time. The fact is modest gifts to the animals throughout the year make up a large portion of the donations we receive at Talbot Humane. As for our volunteers, we know we could not do all we do without them. We would love you too to join our volunteer force- whether you can give 2 hours a month or 2 hours a day. We appreciate you. During this season of giving, we hope you choose to support the animals of our community. Each year our open admission shelter takes in over 1,200 animals, including animals from other shelters when over capacity and animals from neighboring communities when there are no resources for these pet owners. We provide food to mid-shore residents through our pet pantry. We offer spay neuter services at very low or NO cost to Talbot & Dorchester County residents. We provide behavior intervention for pet owners in an effort to keep pet families together, end of life services for beloved pets in need, and, far more. When we each do our part, together, we surely make a difference in our little corner of the World. Your sacrifice will save a life. Talbot Humane is making it simple to support our needs on this day- join us in the “coffee challenge”! 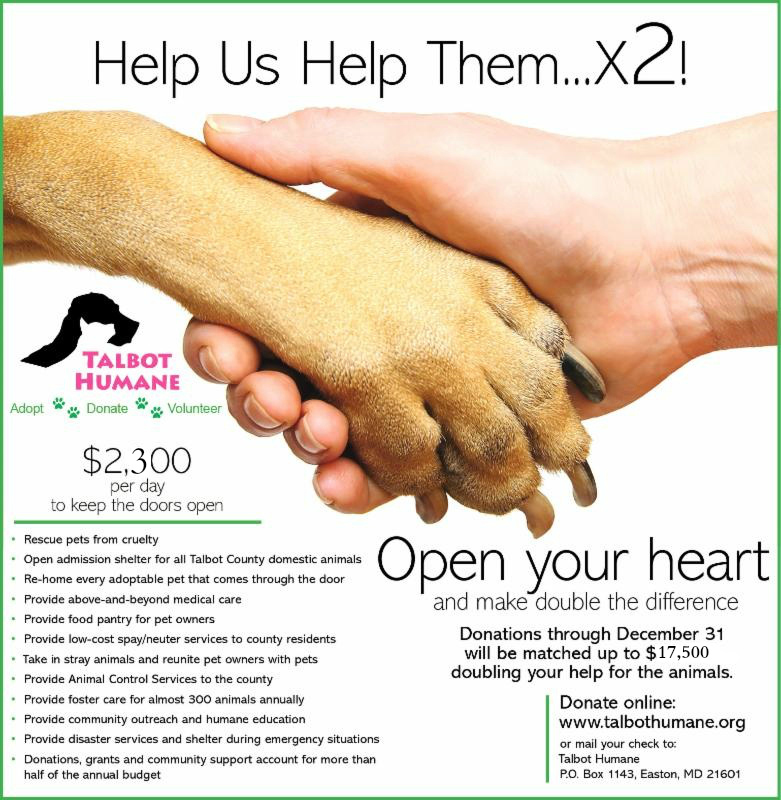 Donate $10 to Talbot Humane on #GivingTuesday to make a difference for the animals and citizens in need. We figure $10 is what many of us spend on coffee during the work week, maybe a carry out lunch, or our soda fund for a couple of days. A small sacrifice to make a HUGE difference together! Your $10 will be part of our matching campaign. Imagine this. If 100 friends give $10 each we have $1,000- turned into $2,000! If 1,000 friends give $10 each we have $10,000- turned into an amazing $20,000! It is THAT simple! When we each do our part, together we make SUCH a difference! Join us on #GivingTuesday to make a difference in our little corner of the World. You can make your donation online by clicking below, drop it in the mail to Talbot Humane PO Box 1143 Easton, Maryland 21601, stop by and see us at 7894 Ocean Gateway, or in any of the many donation containers around Talbot County. Thank you friends. YOU are saving animals of our community with your support! Talbot Humane has received an amazing gift to the animals- a matching gift of $17,500! Thanks once again to the generosity of the St. Johns Foundation and an anonymous donor, our ability to make a difference for the animals of our community has doubled. Your gifts from our mail campaign are included in this matching program, as well as any donation made during the holiday season where you note “matching” in the memo line. Our goal for this year’s holiday and end of year giving campaign is to raise $70,000 for the animals. The money raised goes directly toward ensuring our programs and services to the pets and pet owners of our community continue through 2016. When you give local, you see your money used in your community. 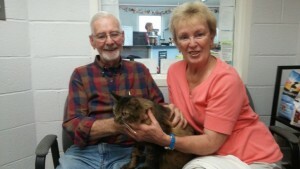 Talbot Humane is more than just a successful open admission animal shelter. When you support us you are saving the lives of animals on your street. Spaying and neutering animals in your neighborhood. 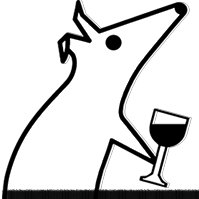 Filling the bellies of animals in your town. Providing humane education in your local schools. This is what your donation does everyday at Talbot Humane. You can make an online gift right now by clicking HERE, or, for more information on how you can make a difference for the animals contact our office today at (410) 822-0107 or info@talbothumane.org. Oldies But Goodies! Adopt a Senior Pet Month! November is National Adopt A Senior Pet Month! In honor, Talbot Humane is offering a number of wonderful opportunities for our senior pets and the seniors in our community! All Pets 7 years and older will have their adoption fee 1/2 price. 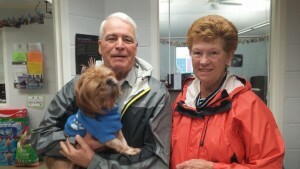 All Adopters 60 yrs + who choose a “senior” pet will have the fees for cats waived and dog at $40. We know that animals enrich our lives, and an older pet is often a perfect fit for many lifestyles. We also wish to encourage our community of active seniors to consider adding to their family, or consider volunteering with Talbot Humane! For more information on these specials, adoption, or volunteering, contact us today at (410)822-0107 or info@talbothumane.org. Hair O’ the Dog is at it Again! Yup! Those Crazy Cats at Hair O’ the Dog are at it AGAIN! They are challenging Talbot Humane staff and volunteers to a cook-off for the animals! This time the required ingredient is BEER. Any brand, any flavor. You vote with your dollar bills to help the animals and fill the needs at Talbot Humane! We are currently in need of a number of big ticket items. Things like a new front door, a new water main, repairs to our roof and we want to be able to work on a project to bring natural light into our cat condos. All of these cost a chunk of $$, so your support counts!